Don’t you wanna snorkel at Dolphin Bay? You can see beautiful coral and fish. 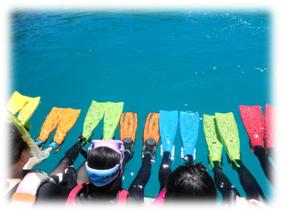 This activity is suitable for everyone who wants to enjoy life underwater. * For a safety reason under 3years old can’t join this activity. * This program is not swimming with the dolphin. * Who are pregnant can’t join. * A child 3-12years old participating must be accompanied by an adult. * We have mask snorkel and fins it is encouraged you bring own so mask snorkel and fins. 1．For cancellations made 2 days or more, no fees are charged. 2．For cancellations made 1 day before 8AM～1 day before until 5 PM, 50% cancellation fee is charged. 3．For cancellation made 1 day before after 5 PM～the day of reservation date, 100% cancellation fee is charged. Copyright© 2015 Dolphins Pacific. All Rights Reserved.